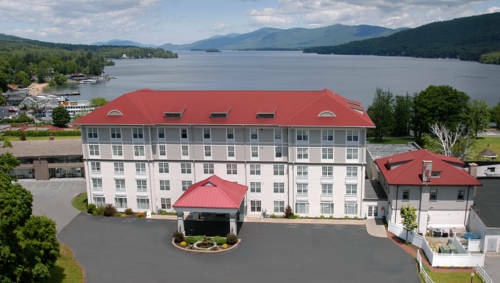 Located at the southern end of Lake George. Conveniently within walking distance of the village the steamboats and both public beaches. One nights deposit including 7pct room tax 4pct occupancy tax and a USD6.00 resort fee will be applied to your credit card to secure the reservation. All reservations must be cancelled 72 hours prior to your scheduled arrival date to receive a full refund. Please make sure the reservationist provides you with a cancellation number. Exceptions may apply - please see rate rules. Adjacent to hotel. Fabulous view overlooking Lake George. Open nightly. Open air cafe overlooking lake George adjacent to property. - Lake George Steamboat Co.
~29 miles from Lake George. ~44 miles from Lake George.